Never give up on what you really want to do. The person with big dreams is more powerful than one with all the facts. — Albert Einstein. 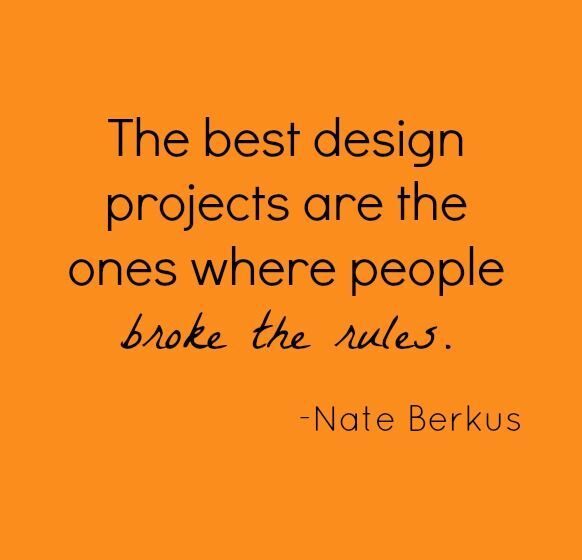 I am working on a design project and thought this was a great piece of inspiration…and by “break the rules” I would say question the rules, the status quo, the normal way of doing things. Sometimes our perception of limitations/rules needs to be broken by thinking creatively about solutions and by designing experiences. Strategy and Business published a piece on doing business where governance is weak. They talk about how to succeed in markets that are prone to ethical and legal risks and focus their article on examples in Asia and the Middle East. It’s a fascinating read and one that illustrates principles for doing business that can be applied to our region of focus – Latin America. 1) align vision and values – this is about ensuring that all stakeholders – from board members to business unit leaders – share the company vision and their corporate values which includes ethical behaviour and how to deliver a product or service in the region. This is particularly important when managing country operations from headquarters outside the region (e.g. from the US or Europe). 2) understand the “way to play” at the local level – uniquely local ways to play exist and should be planned for. How relationships are built and how local talent is utilized is extremely important when contemplating success in Latin American markets. 3) identify key stakeholders – as mentioned in earlier blog posts, it’s important to identify who are the people that are decision makers and influencers in your industry and in the environment in which you operate. 4) build your brand – look at ways to engage your clients with your brand specific to the market. Understand your brand personality at a corporate level but tailor it to your market. You can minimize risk in Latam and emerging markets by having a strong brand that connects to users on many different levels. 5) stay vigilant – empower your local team but stay vigilant of what is going on. Tapping into resources like your country/Embassy trade representative or local expertise can help you stay in tune with local developments. Ensure that vision, values and company policies are not compromised. 6) adapt the governance model – this is the final suggestion from the writers of the article and it’s something that Hipona Consulting strongly recommends whether your company operates internationally or locally. It’s about making sure that members of your board represent the diversity and dynamic characteristics of your company, stakeholders and market. Local board members or committees can help connect the company’s interests to local interests and at times can prove very valuable to getting ideas – and company vision – across.